Have you sensed deeper clarity in those hard dark places? William Cowper—already a physically and emotionally frail little boy—received the greatest blow of his life at only six, when his mother died. From what we know about William’s life, he seemed unable to recover from such a hollowing loss. Even as a young adult, having been educated and licensed as a lawyer and passing his exams, he struggled with profound anxiety and depression. Varying accounts suggest either the prospect of the bar exam or a panic attack before an interview hurtled him into a mental breakdown. He failed to rebound. Compounded by a disastrous love affair, William turned to what he considered his only remaining recourse: suicide. Thankfully, his attempt miscarried. But it did secure his residence in an insane asylum for the next eighteen months. During those long, dark days, William returned to the teachings of his father, an English clergyman. He wrestled with questions of the soul, of the peace that eluded him in the profound pit of his depression. It was there in the asylum that he was affronted by the words in Romans 3: “For all have sinned and fall short of the glory of God”—but then found penetrating hope in the sacrifice of Jesus. At the age of 33, in 1764, William Cowper met forgiveness more surpassing than his sin, his hopelessness. 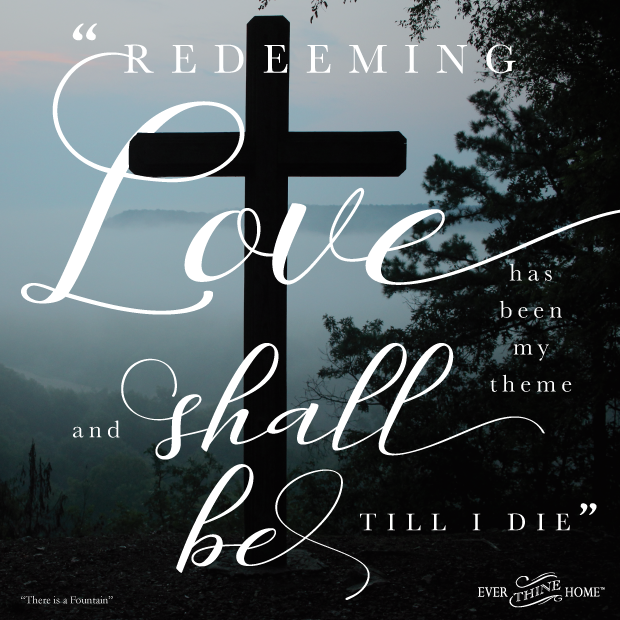 As he wrote later, Redeeming love has been my theme, and shall be till I die. Upon his partial recovery, William moved in with a retired minister and his wife—and eventually became a member of the parish of Rev. John Newton, author of Amazing Grace, developing a close friendship with Newton. They worked together in authoring religious poetry for the church, eventually completing a renowned hymnbook together. Newton became a spiritual father to Cowper and a real source of needed inspiration in helping him overcome his spells of religious doubts, mental depressions and emotional morbidity. Even after Cowper’s conversion, he endured several periods of time when he seriously doubted the love of God for him and his security as a believer… It was at the writing of these words [of this hymn] that he became aware of the efficacy of Christ’s complete atonement for his sins. We glimpse the intensity of Cowper’s feeling through the graphic nature of the lyrics, whose bold metaphor was actually (unsuccessfully) sought to be changed in 1819. Cowper died having authored a total of 67 hymns proclaiming the greatness of his God. Perhaps you, like Cowper, have come to know God not only through your triumphs, but also through the fiercest battles of your soul. May you come to know intimately this truth, as William did: Dear dying Lamb, thy precious blood shall never lose its power.